Organizing information for lawyers is hard work! When you’re responsible for organizing information for lawyers, you have two constant challenges. The first challenge is the lawyers themselves. All lawyers have certain traits in common—they’re autonomous, individualistic, and more independent than most other people are. That’s what makes them good lawyers, but not easy sometimes for the rest of us to work with. The second challenge is collecting, organizing, and protecting a lawyer’s information. There’s a lot to collect, organize and protect! Most lawyers steadfastly refuse to part with any piece of information. A letter, a contract, a Post-it note with an idea written on it—if it ever was useful in the past, or just might be useful in the future, a lawyer will want to hold on to it. Organizing all of that information, while dealing with the lawyers that create it and depend on it, can be overwhelming at times—but it doesn’t have to be! The solution is Taming the Digital Chase. Taming the Digital Chase is truly the first practical book about organizing for lawyers whether on paper, digital, or a hybrid of the two. 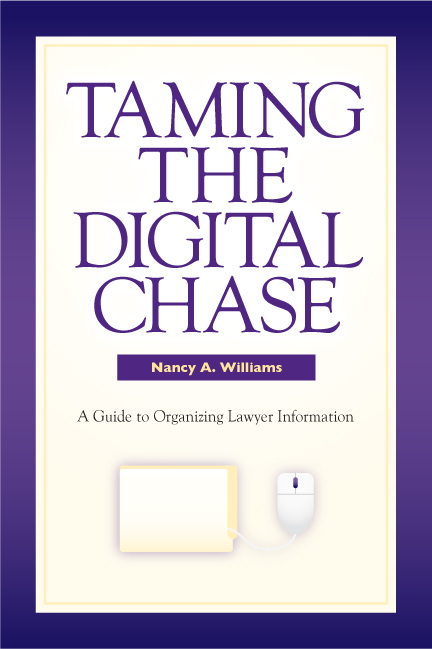 Written by Nancy Williams, Taming the Digital Chase is a road map to follow for organizing legal information. Nancy has worked “in the trenches” with lawyers, so she knows the challenges first hand. Having read many of the more generic books about organizing information overall—packed with theory but short on practical how to advice, or good for other industries but not written for the unique needs of law firms or law departments—Nancy decided to put all of her years of real-world legal experience into a book. Taming the Digital Chase is a plain-spoken, practical guide—no technical language or high flying theory—filled with useful examples, illustrations, flow charts, and easy-to-follow lists to help you get a better handle on lawyer information. Understand lawyers and their work, so that you can work with them. Organize lawyer information according to a practice area process. Establish content categories based on the practice area process activities. Create good, searchable file names by applying some naming guidelines. Taming the Digital Chase is a chance to step back and look at your information challenges differently, to change your system from the bottom up if necessary, and to carry forward the practices you will need to survive and thrive no matter what the future brings.